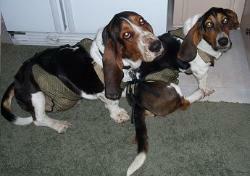 Male & female dog diaper testimonials from current/past customers. and stays in place well." Bianca is a 15 lb. that did not work. I comfortable but could not find anything. doesn't even seem to notice them." "HI, I just wanted to let you know that we did receive the garment in a very timely fashion. 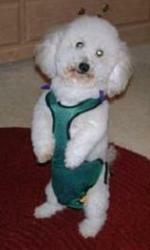 wearing a size Medium dog diaper. "The trousers are great ...these really work!" trousers, as you can see in the picture. this product in my desperate search for a solution. too many side effects, even at the lowest dose." We rescue senior dogs....we've had Ginger and Tasha for 1 year, 15 and 17 years old. originally bought diapers from the major pet supply store. diaper to anyone. Thanks again!" take her in and she remained in foster care for 3-4 years. barricading her in the kitchen. see he is a huge dog. The trousers fit him like they were custom made." TA-DAA we are all happy campers. Thank you for your great product!!! run of the house again, and we can enjoy her company for the rest of her life. this great product in vet journals and such. Thank you so very much for such a great product!" Thank you so much for what you do!"